The US attorney general, Jeff Sessions, has announced new reforms and guidelines for immigration enforcement including the speedy hiring of immigration judges and detention of all adults crossing the border. Immigration advocates decry the reforms as bigoted. “For those that continue to seek improper and illegal entry into this country, be forewarned: This is a new era. This is the Trump era. The lawlessness, the abdication of duty to enforce our immigration laws and the catch and release practices of old are over,” Sessions said, announcing the new reform and guidelines before audience of Customs and Border Protection agents in Nogales, Arizona on Tuesday. Sessions said the reforms were intended to reduce the backlog in US immigration courts. Among those reforms, the Justice Department has already sent 25 additional immigration judges to deal with the backlog at detention centers along the US-Mexico border. Sessions said 50 more would be added this year and 75 next year through a streamlined hiring plan to cut down on the 18 to 24 months delay in hiring. Under the new measures, all adults apprehended at the border will be detained. Sessions said the MS-13 and cartels had turned cities and suburbs into warzones, raped and killed innocent citizens, and smuggled poison and human beings across the border. “Depravity and violence are their calling cards, including brutal machete attacks and beheadings,” added Sessions in a statement. The Attorney General also announced new guidelines were being issued to federal prosecutors that mandated heightened powers for prosecution. “We are going to shut down and jail those who have been profiting off this lawlessness,” Sessions said but added no details on how that might happen. Migrants from Central American countries have been known to pay smugglers, known as “coyotes,” up to $11,000 to lead them across the border. 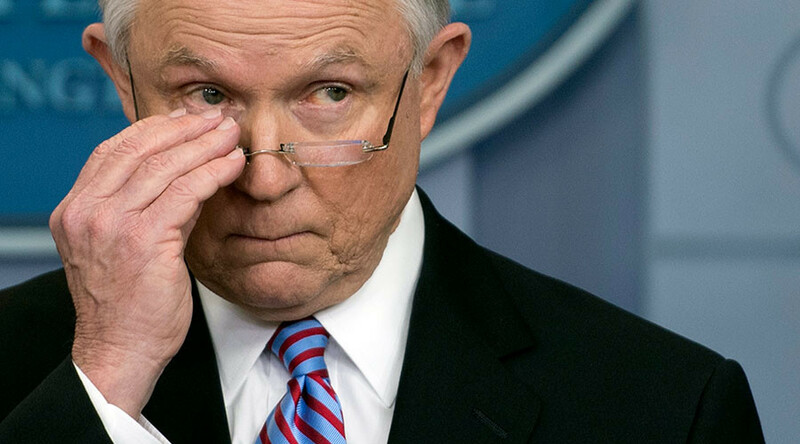 Sessions said federal penalties for immigrants entering the country illegally will be increased from a misdemeanor to a felony for those trying to re-enter the country a second time. Prosecutors are now directed to charge criminal aliens with document fraud and aggravated identify theft which carries a two-year mandatory minimum federal sentence. US Attorney Offices are being told to designate an Assistant United States Attorney as the Border Security Coordinator for the district and it will be their responsibility to coordinate criminal immigration enforcement responses for their office. US Attorneys are also directed to make prosecutions of assaults on federal law enforcement officers a top priority. “If someone dares to assault one of our folks in the line of duty, they will do federal time for it,” said Sessions. Reaction to Sessions’ reforms was swift from immigrant rights advocacy groups. The reforms and guidelines come as the flow of immigrants arrested along the border in March were the lowest in 17 years. There were fewer than 12,000 people arrested while attempting to cross the border illegally in March 2017, a 64 percent decline from the same time last year, according to US Customs and Border Protection (CBP). The number of families and unaccompanied minors has likewise dropped to 37 a day in March, down from 291 a day in January. “This area used to be really hot,” Marlene Castro, a Border Patrol supervisor, told the Los Angeles Times while driving through the wilderness along the border between Hidalgo and McAllen, Texas. “You couldn’t move. Every time you turned a corner, you’d run into group after group,” she added. Castro has worked for the CBP for almost 20 years and insists the agency is not doing anything differently. Trump’s executive orders, issued in January, simply have the CBP enforcing the laws already on the books, she told the LA Times.